Emperor Palpatine’s personal guard and assassin squad. Always at his side. Silent. Loyal. Deadly. Royalty and high-ranking government officials in any time, in any galaxy, are frequent targets for assassination. They require constant protection, usually from specially-trained personnel. As leader of the Galactic Empire, and, less openly, a Sith Lord, Emperor Palpatine was no exception. Nor was Lord Darth Vader. Both were protected by a cadre of elite soldiers called, at various times and by different sources, the Red Guard, Emperor’s Royal Guard, Imperial Royal Guard, and more simply Imperial Guard or Royal Guard. The Royal Guard accompany the Emperor aboard the Death Star II. Courtesy of LucasFilm/Disney. 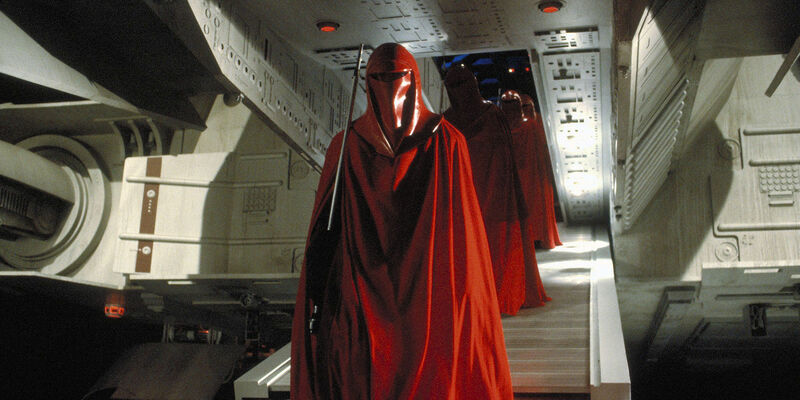 First-appearing onscreen in 1983’s Episode VI: Return of the Jedi , the red-robed sentinels are revealed to have silently protected the Emperor throughout his rein in the chronologically earlier films Episode II: Attack of the Clones, Episode III: Revenge of the Sith , and Star Wars: The Clone Wars . In Rogue One: A Star Wars Story , set between Episodes III and VI, we see for the first time that their detail includes protecting Darth Vader, also a Sith Lord and Emperor Palpatine’s second. At least two Royal Guardsmen stand vigil at Vader’s Bast Castle on Mustafar while the Lord himself floats armor-less and vulnerable in his healing tank of bacta. 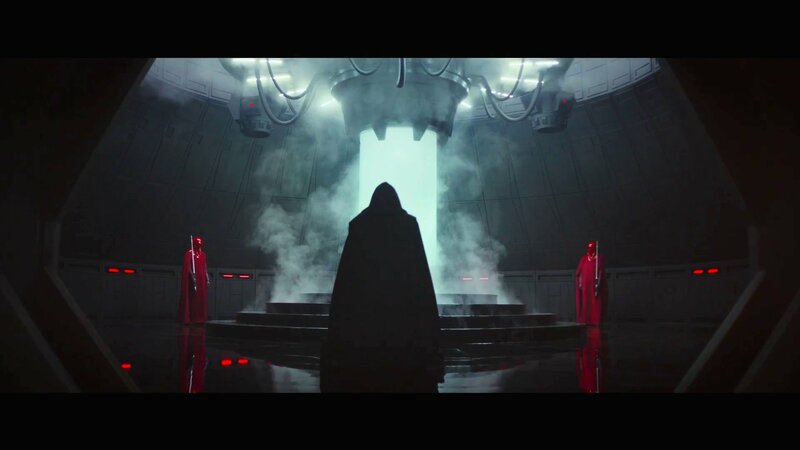 The Royal Guard in Rogue One at Darth Vader’s castle. 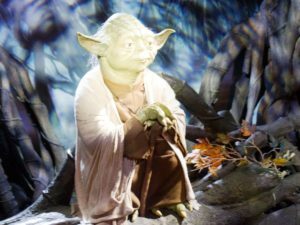 Courtesy of LucasFilm/Disney. Beyond the screen, the Royal Guard protect the person and serve the will of the Emperor in numerous books and comic books both Canon and Legends. Much of the allure of the Royal Guard is the mystery created by their uniforms. Many a fan has wondered: What is beneath those red robes? Are Guardsmen human beneath their shining red helmets? Are they droids? Are they some other species created or bred for the role, like the Noghri who later appear in Legend stories serving the Vader family? What are the capabilities of the Guard’s ubiquitous polearm weapon? 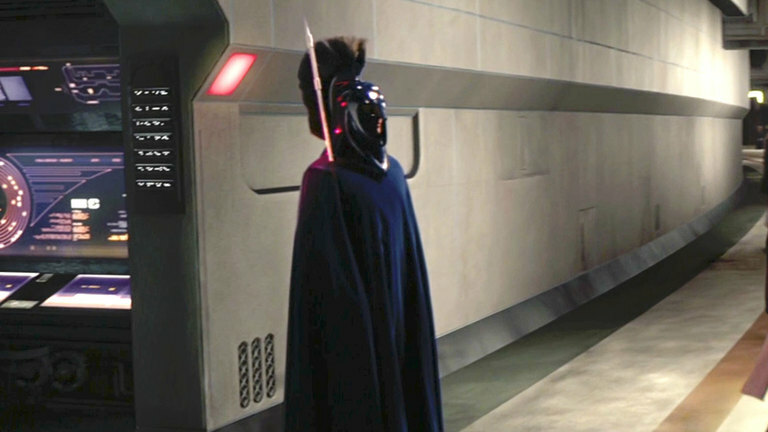 The Royal Guard was created by Palpatine upon his transition from Chancellor to Emperor, replacing but not evolving from, the blue-robed Senate Guard. Evolution was their original intent, hence the similarity in the costume design. The loyalty of the Senate Guard was, of course, to the Senate. Palpatine wanted protectors who would be privy to his most private dealings that were loyal only to him. Initially, he replaced the Senate Guard with Senate Commandos recruited from the most highly-trained, most obedient troopers in the Clone Army of the Republic. A Senate Guard’s uniform looks similar to the uniform of the Royal Guard. 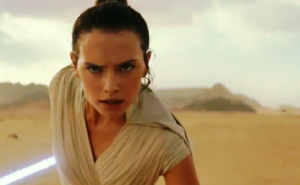 Courtesy of LucasFilm/Disney. Not fully trusting the clones, he sought to replace them at his earliest opportunity. Once Palpatine reorganized the Galactic Republic into the Galactic Empire, appointing himself Emperor, he began the process of phasing the clones out of service, rotating in soldiers who enlisted, or were conscripted into, the Imperial Army. Simultaneously he instituted a recruitment and training program for the Senate Commandos’ successors. The men who would become the Royal Guard were chosen from the ranks of the Imperial Army based on their high size, strength, intelligence, and loyalty to the Empire and Emperor himself. 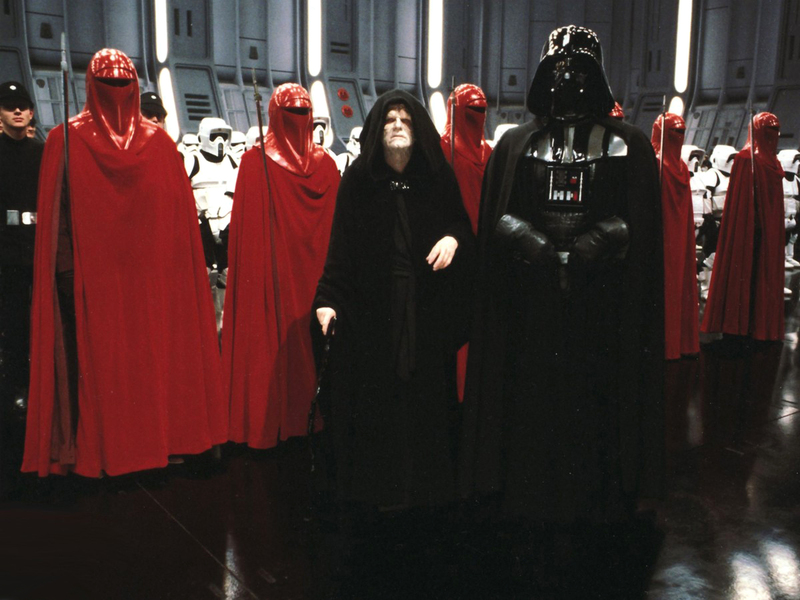 From the moment the first class of Royal Guard graduated, they became the Emperor’s sole and constant guard, silently witnessing most of his dealings even in his private offices, and accompanying him always in public, as well as during his travels to and from military installations such as the Death Star. 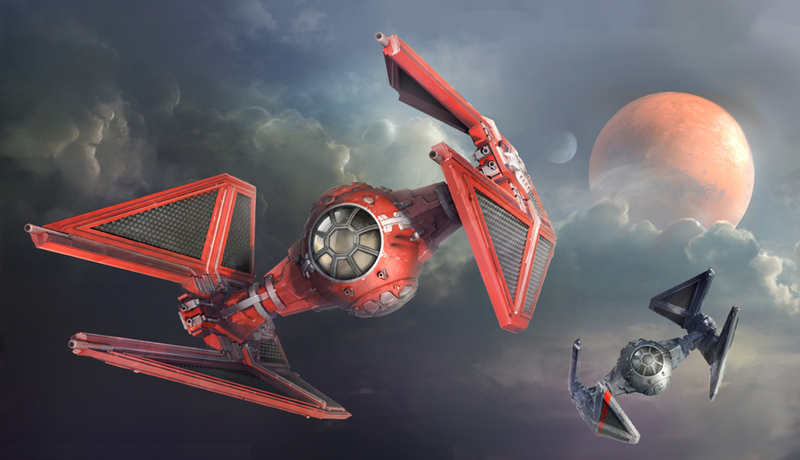 The Royal Guard even flew special red-painted TIE/Interceptors to signify their role and mission. A Royal Guard red TIE/Interceptor. Courtesy of Fantasy Flight Games. The Royal Guard answered only to Emperor Palpatine, even, as in this deleted scene from Return of the Jedi, raising their weapons in warning to Darth Vader. Indeed, until their appearance standing guard over Vader in Rogue One, it was believed that the Guard protected only the Emperor. 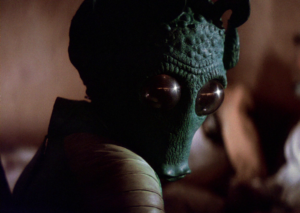 Despite their presence in Vader’s bacta chamber in Bast Castle, their first and only loyalty is the Emperor himself. As Vader was ordered to live on Mustafar, the location of Anakin Skywalker’s death, it’s also probable that he was ordered to accept the protection—and watchful eye—of his master’s Royal Guard. Protection was the primary, but not sole, responsibility of the Emperor’s Royal Guard. They also acted on behalf of the Emperor, often carrying out covert missions, including assassination. Royal Guardsman Kir Kanos. Courtesy of Darkhorse Entertainment. As experts in many martial arts, including the venerable Echani fighting form, and proficient with a range of weapons, the Royal Guard were elite commandos rather than mere bodyguards. To keep their skills sharp, Guardsmen were rotated periodically back into Imperial Army Special Operations teams. 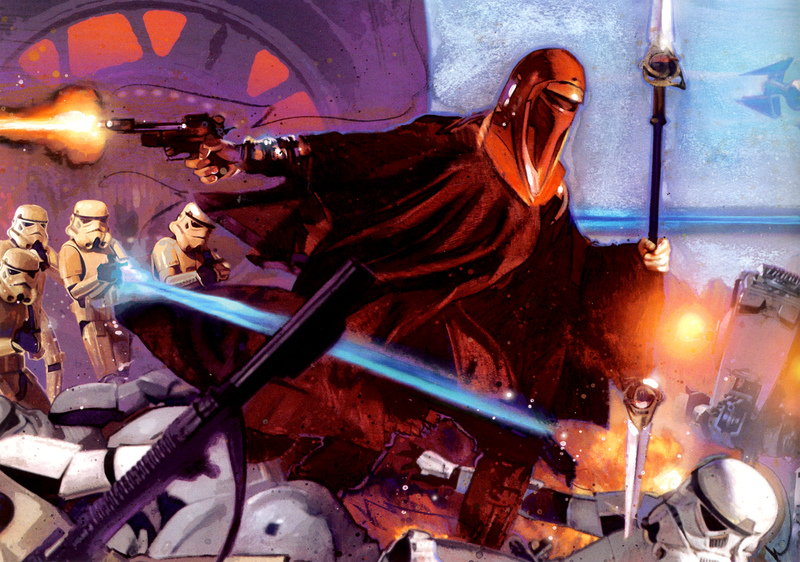 As formidable as they were, there existed among the red-cloaked Guardsmen even more elite operatives. Two select sub-units operated at the Emperor’s command: the Emperor’s Shadow Guard and the Imperial Sovereign Protectors. The Emperor’s Shadow Guard in full uniform (left) and combat-ready without cloak (right). 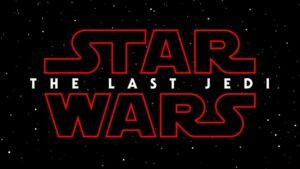 Courtesy of LucasFilm/Disney and Darkhorse Entertainment. 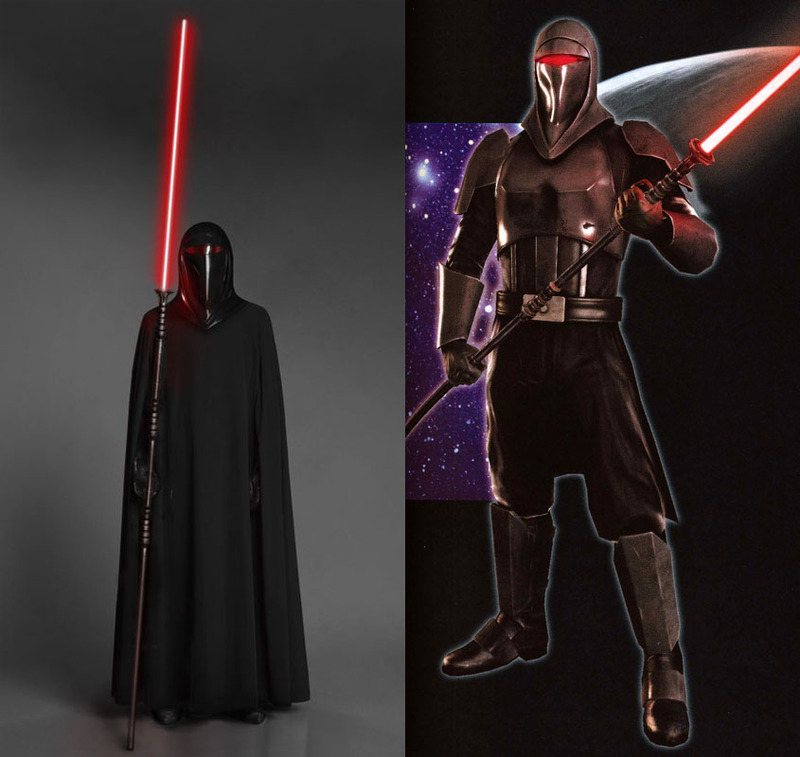 Emperor’s Shadow Guard were Force-sensitive soldiers trained by Darth Vader and often operated under his field command. Shadow Guard operatives were recruited from the Sun Guard, a widely feared paramilitary unit of Sith cultists often employed by Palpatine for assassination, guard duty, and similar actions. When the Sun Guard was all but wiped out on the orders of Count Dooku near the end of the Clone Wars, the surviving, viable members were moved to different roles. Most became Royal Guard while those with a usable sensitivity to the Force were recruited to the Shadow Guard to assist in the Great Jedi Purge. Also called Royal Guard Champions, the Imperial Sovereign Protectors were the elite of the elite, the most formidable and most loyal of the Royal Guard, a unit created for its loyalty. 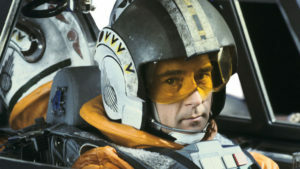 Those who would become Imperial Sovereign Protectors endured years of extreme training in all aspects of soldiering and in wielding the Dark Side of the Force. Of the two most famous Royal Guards, one was also an Imperial Sovereign Protector. 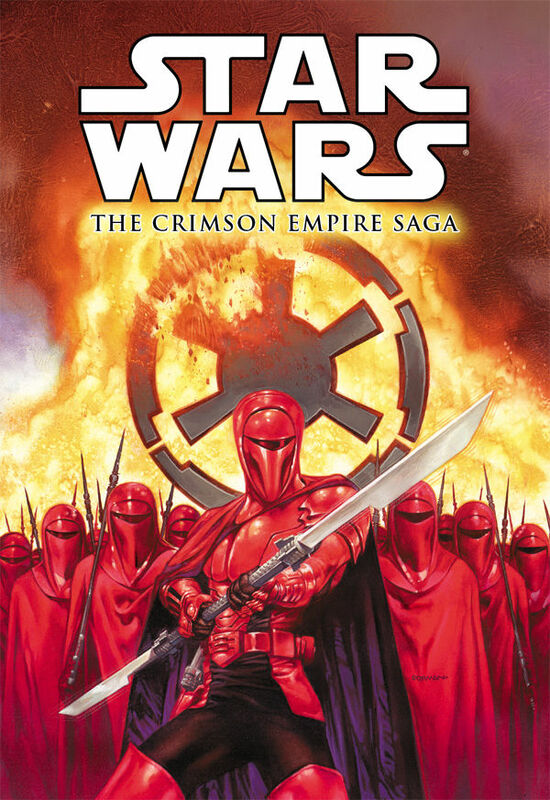 The cover of The Crimson Empire Saga graphic novel. Courtesy of Darkhorse Entertainment. Told through the novels Dark Empire and Dark Empire II , and the Darkhorse comics Crimson Empire , Crimson Empire II: Council of Blood , and Crimson Empire III: Empire Lost , Carnor Jax was an Imperial Sovereign Protector who conspired to overthrow the Emperor. An apprentice to Lumiya, the Dark Lady of the Sith, Jax was himself an aspiring Sith Lord. Following the death of Emperor Palpatine and Darth Vader at the Battle of Endor in Return of the Jedi, Jax and Lumiya attempted to take over the Empire, arranging for the destruction of the Royal Guard and the Emperor himself, resurrected through a succession of cloned bodies. Jax’s destruction of his former fraternity was complete save for one. The sole survivor of the Royal Guard, Kir Kanos, remained fiercely loyal to the Emperor and his ideals long after his death. Kir Kanos slew the would-be Emperor Carnor Jax before embarking on a crusade to exact vengeneance on all how played a part in the death of Emperor Palpatine. His quest saw him infiltrate the Black Sun criminal organization and assassinate another pretender to the emperor’s throne, ally with Boba Fett, and join and then help to destroy the Restored Empire, one of many splinter organizations that arose in the confusion following Palpatine’s death and the destruction of the second Death Star. Ultimately, Kanos abandoned his vengeance and, hoping for a quiet life of solitude, faked his own death and disappeared. The Royal Guard debark the Emperor’s shuttle ahead of him. Courtesy of LucasFilm/Disney. Beneath their omnipresent crimson cloaks the Royal Guard are well-armed and –armored. Although they are experts with most modern weapons, adopting the best tools for a given action, the standard protection-detail weaponry issue consists of a heavy blaster, vibroblade or double-vibroblade, and force pikes. The last is the short metal polearm carried by all Guardsmen accompanying the Emperor. It’s a melee weapon with a vibro-edged head that can be used for stabbing, slashing, or bludgeoning, or, by employing its variable-level stun settings, as a shock baton. Both the Emperor’s Shadow Guard and the Imperial Sovereign Protectors, being Force-sensitive and often engaged in Jedi hunting, often replaced the force pike with a variant that used mass-manufacturered lightsaber blades in place of the standard issue vibroblade. The Royal Guard, including its sub-units, wore head-to-toe armor beneath their robes, or cloaks, in the case of the Imperial Sovereign Protectors. That armor was simultaneously far stronger and more flexible than Stormtrooper armor, and was based on Mandalorian designs. Royal Guard armor was an unbroken and uniform red with red visors while the Shadow Guard armor was the reverse, black with a red visor, and the chest plate, cloak, shoulders, and portions of the legs, arms, and helm of the Imperial Sovereign Protectors were black. Fight against and as Royal Guard in Star Wars: Battlefront. Courtesy of Electronic Arts. 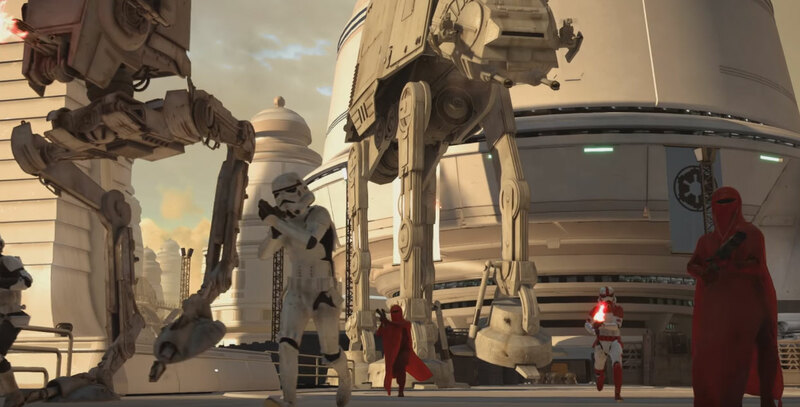 You can play as a Royal Guard in Star Wars: Battlefront as you can see in this player-made YouTube video of gameplay and battled against Force-powered, lightsaber-pike-wielding Shadow Guard in Star Wars: The Force Unleashed. 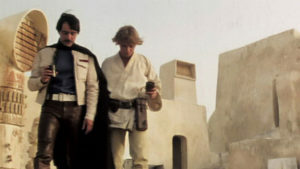 Most lines of Star Wars action figures, including LEGO, include figures of Royal Guard, Shadow Guard, and Imperial Sovereign Protectors, and Carnor Jax and Kir Kanos.